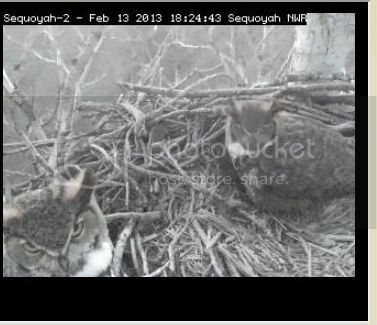 One of the regular Sutton chatters, okmeme, got this scap last night of both Mr and Mrs Hooty on the nest. 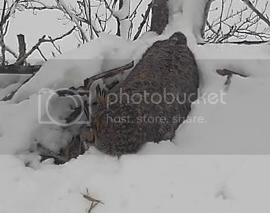 15 February 2013: It appears that the Bald Eagle egg and one of the two owl eggs have disappeared two nights ago. Whether this is due to predation, breakage, or something else we are not sure. If the rotten eagle egg broke, the sticky contents may have caused it as well as an owl egg to stick to the incubating female's feathers and she may have unintentionally carried them off when leaving the nest. As unlikely as that may sound, lucky camera viewers actually got to see this happen to a female eagle at one of our previous eagle camera nests several years ago. Now I was watching the Sooner Lake nest at Sutton about 5 years ago when the carry-off episode they are mentioning occurred. I suppose it is possible. So we may only have one very spoiled owlet to look forward to at Vian. On Feb 18th Mrs Hooty got to sit through a short severe hail storm. It didn't phase her. As soon as I get home I'll add scaps to this post - they are on my laptop. And here they are - not exactly small hail! Today she spent most of the morning buried in snow. Now she has managed to climb out from under the worst of it. This Vian nest has had the strangest season. The cam is solar powered and wasn't on this morning because of weather. Imagine my shock when it finally came up and the nest was completely empty - no egg, no Mrs. Hooty, a stick lying through the middle of it and what appears to be a stain both on the stick and the bedding underneath it. 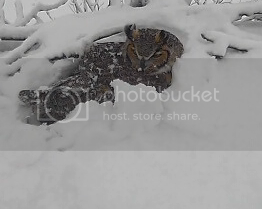 26 February 2013: The Great Horned Owl persisted in incubating her remaining egg during the snowstorm of about a week ago and continued doing so during several days of nicer weather after the storm. 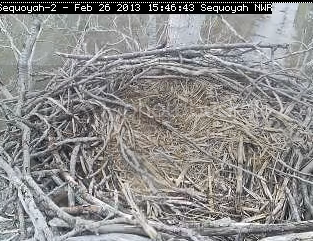 Then another storm system moved through bringing cold rain during the past day or so, and the Sequoyah NWR nest camera was off again for a while. 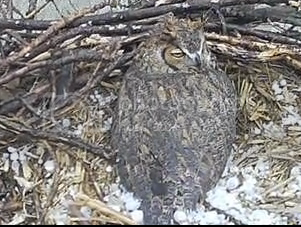 The camera came on about midday today revealing an empty nest. The camera was not operational when the owl and the egg disappeared, so we do not know the extact cause. It is disappointing for the second attempt in this nest to fail this season. We are continuing to work behind the scenes to get another nest on line this season, and while it may happen soon if things go well, we don't yet know for sure if or when it will happen. Thanks for the update on Mrs. Hooty. So disappointing -- I hope she's okay.